MINNEAPOLIS — A 10-yard TD pass from Aaron Rodgers to Randall Cobb with just six seconds left in the first half capped an 80-yard drive and gave the Packers a 16-6 lead over the Vikings at halftime on Sunday at TCF Bank Stadium. The Packers defense began the second quarter with a sack of Vikings QB Teddy Bridgewater. DE Datone Jones got him for an 18-yard loss, the Packers’ first sack in four games. Their last sack came in the fourth quarter of the game against San Diego before the bye week, also by Jones. That forced a punt, and the offense took over on its own 33-yard line. Green Bay regained the lead on a 40-yard FG by K Mason Crosby, his third successful kick in as many tries. WR Davante Adams began the drive with a 9-yard catch but appeared to be limping along the sideline after (Adams would later return to the game). RB Eddie Lacy followed with a 27-yard run, but the drive stalled at the Minnesota 22, bringing on Crosby. The Packers got their second sack of the game on the Vikings’ next drive, a zero-yard variety by LB Nate Palmer following a holding penalty on Minnesota on first down. The Vikings couldn’t convert on third-and-long, and Cobb fair-caught another punt, this one at the Green Bay 22. The Packers did nothing with it, though, as Rodgers was sacked on third down and P Tim Masthay shanked an 18-yard punt, giving the Vikings the ball in Green Bay territory. The Packers defense rose up, though, tackling QB Adrian Peterson for a 3-yard loss and then sacking Bridgewater for the third time in the game. Julius Peppers was credited with the sack. Bridgewater was then replaced on third down by backup QB Shaun Hill, whose pass was incomplete, forcing a punt. It was announced that Bridgewater has a shoulder injury, but his return is probable. He did come back into the game. The Packers took over on their own 20, and Rodgers was sacked on second down, leading to a third-and-15. But Rodgers went deep to WR Jeff Janis, who was interfered with by Vikings CB Terence Newman, a 50-yard penalty. A 14-yard pass to WR James Jones got the Packers into the red zone, and on third down, a holding penalty on LT David Bakhtiari was offset by a roughing the passer penalty on Linval Joseph, replaying third-and-9 from the Minnesota 15. On that play, Vikings LB Anthony Barr was flagged for defensive holding, giving the Packers a first down on the 10-yard line with 19 seconds left. 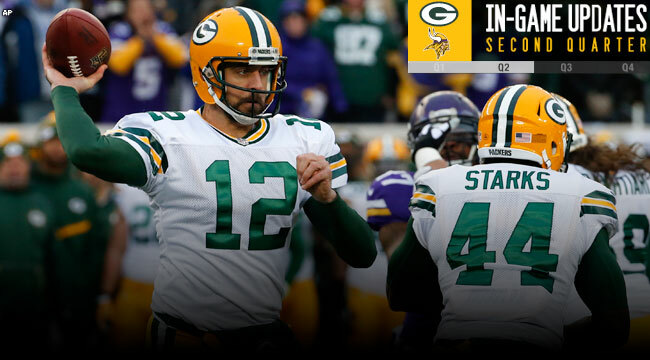 After two incomplete passes, Rodgers found Cobb for the touchdown with just six seconds left on the clock. Crosby’s PAT put the Packers up by 10 at intermission.